The area encompasses 11-blocks, and is undergoing a significant transformation into a vibrant, urban mixed-use district which capitalizes on the increasing sports, hospitality and entertainment venues in the area. Over the long-term, the aim is that the increased activity and investment generated within The District begins to radiate outwards to spur new development, redevelopment and investment in new businesses and retailers in adjacent areas. CentreVenture is able to finance public realm enhancements in the SHED thanks to The City of Winnipeg and The Province of Manitoba through their provision of TIF (tax increment financing). The incremental property taxes from new development projects in the District are being reinvested back in the District through the use of TIF. Activate The District by stimulating new commercial and residential development that will add life to the street and support a growing residential population in the Downtown. 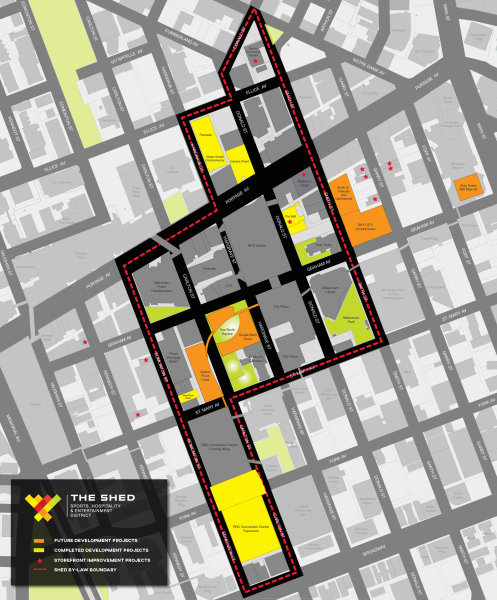 Ensure that planning and development will create connections between The SHED and surrounding districts within the Downtown. ​Protect private sector investments through corresponding investments in the public realm and encourage high quality design, marketing, strategic land assemblies and incentives that will influence desired forms of development within The District. ​Promote The District as an innovative area for urban design and development either through rehabilitating historic buildings, integrating dynamic lighting or utilizing the latest green technologies. Continue to improve safety and security of the Downtown through proactive strategies ranging from improved pedestrian lighting to continued collaboration with the Winnipeg Police Service and BIZ patrols. ​The Downtown Winnipeg BIZ is providing critical animation and operating support for the SHED through their safety, cleanliness, and events programming funded through BIZ levies and corporate support. True North Square , the largest commercial development in downtown Winnipeg history, was unveiled in 2015 and is currently uner construction. The $400 million project is comprised of four towers: a 17-storey, 365,000 square foot Class A office building; a 24-storey, 200,000 square foot mixed-use residential tower; a 27-storey, 275-room Sutton Place Hotel; and a 17-storey, 130 unit Sutton Place residential tower. The entire development will be centred on a new public space, designed with year-round programming and events. Other new planned developments surrounding the SHED are proving the spin-off impact of the SHED strategy. Artis REIT is developing a new 40-storey mixed-use rental residential building at the corner of Graham Avenue and Main Street. New apartment building conversion projects are planned for the Medical Arts Building and the historic Sterling Building.